Father of Tenchi, his wife died when his son was very young. He is always trying to flirt with the ladies but they often recent him as an ugly old man. 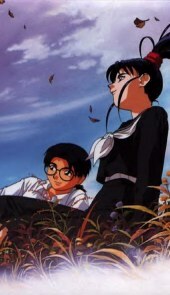 Tenchi in Love, the first Tenchi Muyo movie, Tenchi and the others travel back in time to save Tenchi's mother Ackika. Surprisingly, Nobuyuki looks alot like Tenchi, young and handsome, and alot more shy and sensible, unlike the womanizing middle-aged man he is in the series.